Do you own many accounts and is it difficult to remember their user names, passwords ? Password managers are applications which can provide a solution for this. Just remember a master password and the application will do the rest for you. There are so many Password managers available in the market and we covered many before. Now here we are posting about one which we do not covered earlier, Password Boss. Using this you can easily sync your data between your devices PC, Android, iOS smart Phones etc. Password Boss is the Free password manager and digital wallet designed for anyone who has trouble remembering their passwords. By securely storing personal information and synchronizing it across all devices, Password Boss is the easiest way for people to safely login to websites, access their accounts and shop online. A premium version is available with features such as online backups, 2-step verification and unlimited, secure password sharing. Password Boss offers a FREE and also a Premium service variants. Free version do have a limitation in features. Available for PC, iOS and Android. The premium Password boss will cost you $29.99/year. But when you purchase you can get a cash back with in 30 days if you are not satisfied with the product. You can try the free version of the product also before you decide to buy. 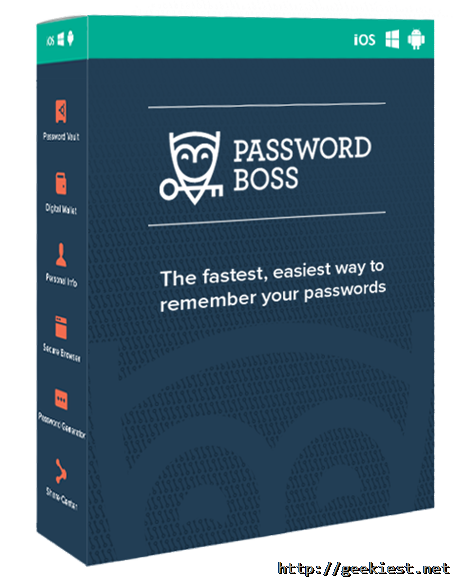 We have a 5 full version licenses of Password Boss Premium for our readers.